I’ve been getting away with using my lovely (if a little battered now) New Balance Minimus Trail 10 shoes for all running duties ever since I retired my aging (and deadly on wet rock) Adidas Swoops. They actually do a really good job, and cope well with most off road conditions. They do however begin to struggle in mud and on grass – typically the kind of ground most fell races and mountain marathons have in abundance. With Mr Sparkle’s Dark Un looming, and another entry for the Saunders Lakeland Mountain Marathon in for later in the year, as well as Grizedale Duathlon and Edale Skyline, I decided to bite the bullet and get some new fell shoes. Ideally, I wanted something with the same shape as the New Balances, the same low weight, the same minimal feel, just with a bit more grip… proper fell studs. Sadly New Balance don’t make anything that fits the bill, so I’ve had to cast the net a bit wider. Inov-8 have developed a far wider range of shoes since my mark-I Mudclaws, catering to every niche of off (and on) road running. Their heel cups have apparently been redesigned slightly, and there are a few shoes in the range that look perfect for the kind of work I’ll be putting them through. There was one sticking point however… price. Ouch, they aren’t cheap. Most are around the £100. It seems strange that I baulk at paying that, when I will spend as much on a tube of carbon handlebars, or a windproof jacket, but in comparison to my New Balances which were half the price £100 is a bit steep. Add that to the fact that they will undoubtedly wear out relatively quickly, I was wary of spending so much. Luckily Wiggle had a sale on one of the pairs of shoes I had been eye-ing up. The Baregrip 200. This is an ultra minimalist shoe, with virtually no midsole. Seeing as I’ve been getting on so well with the New Balances, I thought I’d give them a go. Out of the box, impressions were good. They appear well made, and were supremely comfortable walking around the house. They are a smidge narrower than my NBs, holding my foot securely, without pinching. I’ve been out for a couple of runs in them now, including night time fell racing. In the end, the frozen ground meant I could have easily got away with the NB trail shoes, but the Inov-8s did what was needed. They gripped where needed, and felt light and fast. I could feel *every* little imperfection underfoot. It is hard to describe the sensation. It isn’t comfortable, but neither is it unpleasant. It just is. One thing I have noticed with both the NB and Inov-8s is that with minimal shoes, I seem to be far less prone to going over on my ankle when I’m running. This has in the past been a fairly regular occurrence, especially off-road. I’ve luckily not had any injuries resulting from it, but I’m sure it was a matter of time. I simply feel more stable, and nimble in these shoes. 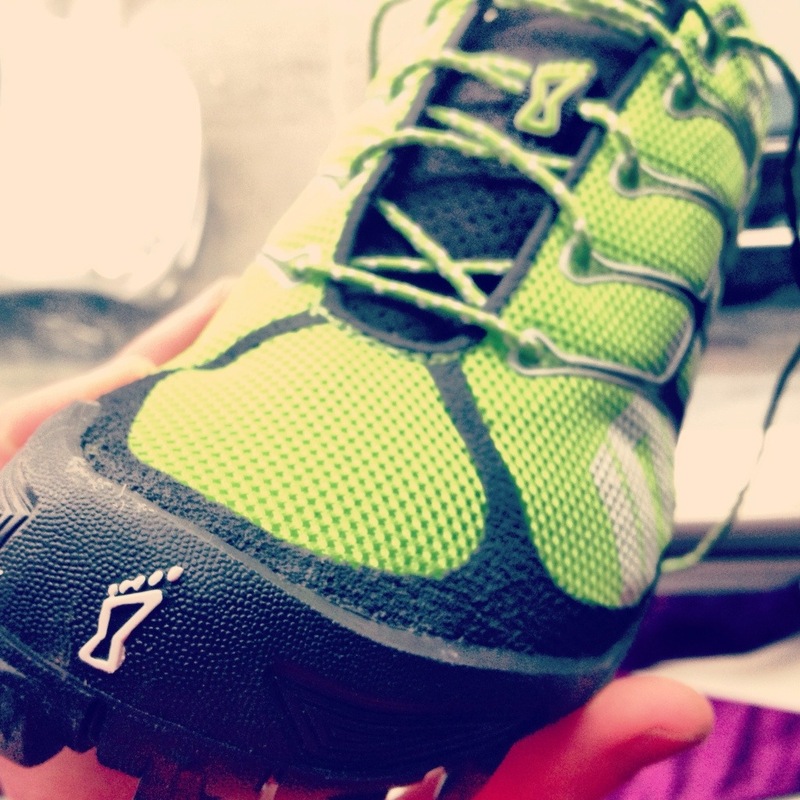 I’ll have to wait and see how the Inov-8s hold up in the longer term, but I’ll write another review later in the year. Nice review Tom! I’ve had mine for about a year and a half and the uppers are finally starting to go around the big toe, but they’ve taken one hell of a battering. They’re great for the shorter fell races and excellent in muddy xc, easily out performing spikes and way more comfy. Though even as someone who is fixated on natural/forefoot/barefoot call it what you may running style I just need a bit more between my feet and the ground for the longer runs/races in rocky places like the Lakes. I did one long run picking up the peaks between Wrynose Pass and Honister and my feet were minced at the end. Having said that it’s a shoe I couldn’t do without. A few minor tweaks would be nice, but that’s more to accommodate my hobbit like feet. Cheers for the feedback Louis. Think I may need to get something like the X-talon for rockier tracks. Did 13 miles round the Peak on Sat, and was really happy with the shoes. Was generally on smooth trails/boggy fell though.